We are increasingly living in a multi-cloud world, with potentially multiple private, public and hybrid cloud implementations supporting a single enterprise. Organizations want to leverage the agility of public cloud resources to run existing workloads without having to re-plumb or re-architect them and their processes. In many cases, applications and data have been moved individually to the public cloud. Over time, some applications and data might need to be moved back on premises, or moved partially or entirely, from one cloud to another. How do we secure data both at-rest and in-transit? Why is data so hard to move? 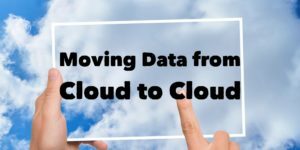 What cloud processes and interfaces should we use to make data movement easier? How should we organize our data to simplify its mobility? Should we use block, file or object technologies? Should the application of the data influence how (and even if) we move the data? How can data in the cloud be leveraged for multiple use cases? Register now for this live webcast. Our SNIA experts will be on-hand to answer you questions. This entry was posted on Thursday, July 5th, 2018 at 5:15 am	and is filed under Cloud Mobility, Cloud Storage. You can follow any responses to this entry through the RSS 2.0 feed. You can leave a response, or trackback from your own site. WordPress generated this page with 44 queries, in 0.506 seconds.